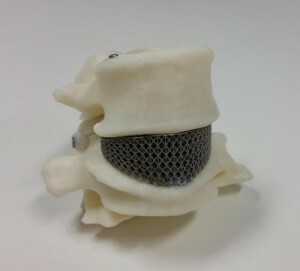 RMIT has worked with a medical device company and a neurosurgeon to successfully create a 3D printed vertebral cage for a patient with severe back pain. A spinal implant cage has been developed by RMIT researchers and successfully inserted into a patient to provide relief from severe back pain. When an abnormal structure of the fifth lumbar vertebra and severe degeneration of the adjacent disc was causing Amanda Gorvin constant lower back pain she was referred to spine surgery specialist Dr Marc Coughlan, at the North Gosford and Prince of Wales Hospitals. Coughlan’s opinion was that spinal surgery was an option, but because of the unusual shape of Gorvin’s vertebrae a standard, off-the-shelf implant would possibly only give her slight relief. He then turned to Melbourne medical device specialists, Anatomics, who worked with Professor Milan Brandt and his team at RMIT’s Centre for Additive Manufacturing at the Advanced Manufacturing Precinct to design and develop a custom-made titanium spinal implant using 3D printing (or additive manufacturing). “This revolutionary process allows the implant to be built layer by layer, adding successive layers of material under computer control – as opposed to the subtractive manufacturing techniques of casting, fabrication, stamping and machining,” Brandt said. Specialist teams at Anatomics and RMIT used a CT scan of Gorvin’s spine to create the customised implant while a second medical device supplier, LifeHealthcare provided additional parts. It has been three months since the surgery and Gorvin has resumed normal activities without any significant pain. 3D printing is proving to be a game changer for manufacturing in the aviation, aerospace, automotive and healthcare industries. The ability to create unique and complex titanium implants for specific conditions, such as the abnormal shape of Gorvin’s vertebral cage, indicates that additive technology could be used to provide ongoing support for patients with chronic pain. The Centre for Additive Manufacturing at the Advanced Manufacturing Precinct based at RMIT’s City campus supports research in a range of areas including bioengineering, aerospace and automotive.